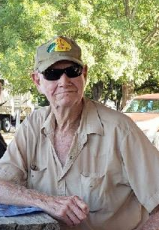 David Barm Barefoot, 72, of Braggs, OK was born March 28, 1946 in Gorman, Texas to Reginald and Vetress (Weatherman) Barefoot and peacefully passed away Wednesday, March 27, 2019 in Tulsa with his family by his side. On November 25, 1989 he married the love of his life, Isabel Gallegos. They shared over 29 years of marriage together. They were the love of each other’s life. David worked as a concrete foreman. Later he was a self-employed contractor. David is survived by his wife of the home, Isabel; sons, Robert Barefoot of Braggs, Bryan Barefoot of Muskogee and Jerry Wood of Vian; daughters, Barbara Gatzen and husband Darin Webster of Muskogee, OK, Sherri Black and husband Tye of Chelsea, OK, Cheri Watkins and husband Joseph of Muskogee; brothers, Reginald Gerald Barefoot and wife Martha of Conroe, TX, Paul Barefoot and wife Sharon of Muskogee, OK; sister, Jackie Cadenhead and husband Jimmy of Midlothian, TX, grandchildren, Joshua Wood, Mickel Wood, Devin Gatzen, Tyler Gatzen, Gabrielle Watkins, Beth Thomas, Brooke Thompson, Colby Watkins, Wesley Wood, Ashley Thompson, Haley Gatzen, Faith Schlegel, David Schlegel and Christopher Barefoot; great grandson, Jake Schlegel and many nieces, nephews and many friends. He was preceded in death by his parents; Reginald and Vetress Barefoot; son, David Lee Barefoot; sister, Deria Lee Barefoot and brother, Robert Dan Barefoot; niece, Jamie Cadenhead. Viewing will be held 11AM to 1PM Sunday, March 31, 2019 at Clifford D Garrett Family Funeral Home Chapel, Fort Gibson, Oklahoma. Burial will follow the visitation at South Bethel Cemetery, Braggs, Oklahoma with Joshua Wood, Mickel Wood, Devin Gatzen, Colby Watkins, Wesley Wood, Christopher Barefoot and Tyler Gatzen serving as casket bearers. The family of David Barm Barefoot has entrusted his care, visitation and burial to Clifford D Garrett Family Funeral Home and Cremation Service.